The ICC World Twenty20 Africa B Qualifier ended with a terrific chase by Uganda to upset overall winners Kenya, to end a week of entertaining cricket in Kigali on Saturday. Uganda set a daunting 186 to win, and they managed to reach that target with seven balls to spare. That victory was however made possible by the second century of the tournament, notched by Dinesh Nakrani, who held his composure to guide his side over the line. 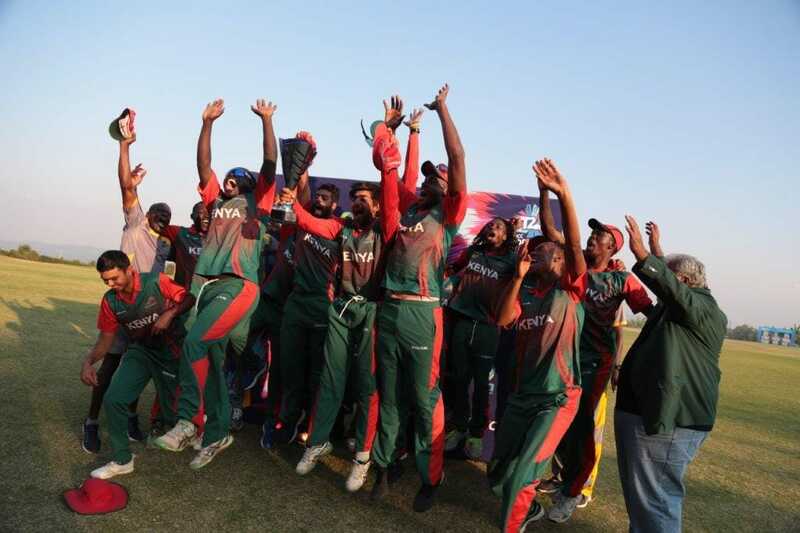 Uganda had won the toss and elected to bowl first, and Kenya responded by setting them a target of 189. Dhiren Gondaria once again contributed at the top of the order, with his 37 off 20 balls paving the way for his middle-order. Collins Obuya enjoyed a fine week with bat and ball, and his 67 from 45 balls was an apt way to end. That knock saw the Kenyans finish strongly, with skipper Shem Ngoche smashing four sixes at the end, to lift his side to 188 for five. In response, Nakrani’s knock was quite a sight to behold. He found an ally in Ronak Patel, who added a calm 40 off 39 balls, while Nakrani was going ballistic at the other end. He smashed a scarcely believable 12 sixes, to reach 102 not out from just 50 balls. In the earlier match, Jaitin Chandubhai was the star for Tanzania, as they inflicted yet another defeat on plucky hosts Rwanda. Chandubhai scored a brisk 79 off just 49 balls. That blitzkrieg saw his side reach 196 for seven, with a helping hand from Muhammad Zafar Khan, who ended his excellent tournament with another half-century. This time it was 60 from 40 balls, as Tanzania continued to score with freedom on what have been very good batting tracks. In reply, Rwanda managed to get to 116 all out, with Erick Niyomugabo top-scoring with 26. Extras were the second highest scorer, with 18, as Rwanda closed off their tough tournament with another plucky display. They lost by 80 runs, but they have gained a heap of wisdom and game-situation experience, which will surely hold them in good stead in the future. Nakrani finished as the top scorer in the tournament with 320 runs at a strike rate of 189. His team mate Mohammed Irfan ended with a tournament high of 13 wickets with a best of 5/12 at an economy rate of 5.37.